Heritage Press Exclusive; the LEC printed their own LEC, #82, in the 7th Series, V. 12, in 1936 with a five-volume set featuring the talents of W.A. Dwiggins. Front Binding – Our weekend of Ward marches on with this delightful Heritage exclusive edition of Francois Rabelais’ Gargantua and Pantagruel, an early French comedic romp filled with fantasy and humor. Despite being printed in the middle of World War II (of which I could compile a post of mishaps and tragedies that beset the George Macy Company’s efforts…perhaps next year? ), Macy managed to produce this lovely 800 page volume packed to the gills with 100 drawings from Mr. Ward, a mammoth undertaking for both press and artist! Rabelais, a monk and practitioner of medicine in his time, is best known for this work, and it’s a defining classic of French literature. This work was also issued as a LEC earlier in 1936, starring W.A. Dwiggins in a five volume set. Ward, as mentioned yesterday, has his bibliography here. And I won’t mince any further words about him here, as I’ve probably gushed plenty about his talents elsewhere on the blog; just know that he did 100 line drawings interspersed in Rabelais’ text. Design Notes – The designer is not mentioned; we do know that LeClercq’s translation comes from the LEC, so it’s possible that Macy borrowed the textual design of that work for this reissuing (W.A. Dwiggins designed the LEC). However, Electra was Dwiggins’ font of choice; here, Scotch is used. So I’m not sure who exactly to credit on this one. The text was composed by Quinn and Boden and put to the page by Ferris Printing Company. The binding is a little strange — the Sandglass observes that a blue stamped design was intended for the book’s tan linen, but as you can see, that didn’t happen with my book (only on the spine). Perhaps World War II once again undermined Macy’s intentions? And that’s as deep as the Sandglass goes into production notes here. Title Page – LeClercq serves as an Introductory voice to the text as well as its translator. 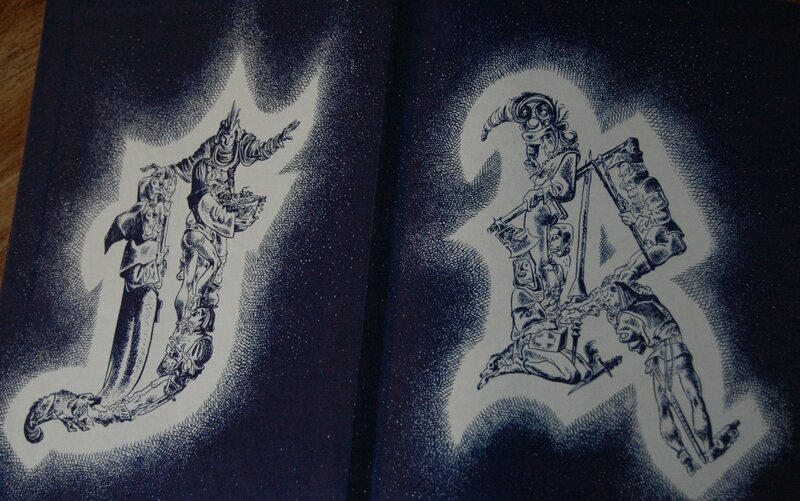 Front Endpapers – It’s always a pleasure to open up a book and be greeted with artwork; here, Ward toys around with Rabelais’ initials, stuffing them with his creations. Page 12/13 – For this work, Ward’s drawings slide in between the chapter’s text. Works with the overall design, in my opinion. Personal History – This was my first purchase of a Heritage/LEC title after I moved! Huzzah! Purchased at the Bookstore in Chico. Eager to read! When I was growing up in another country I had a chance to see a copy of Gargantua and Pantagruel illustrated with incredible art by Gustave Doré. These remarkable images stayed with me for decades. That is why I’m a bit disappointed in this particular HP volume. Lynd Ward’s simplistic, whimsical drawings do a great disservice to this book. It would have been much better had Macy and Co. had simply reprinted Doré’s work and left it at that. 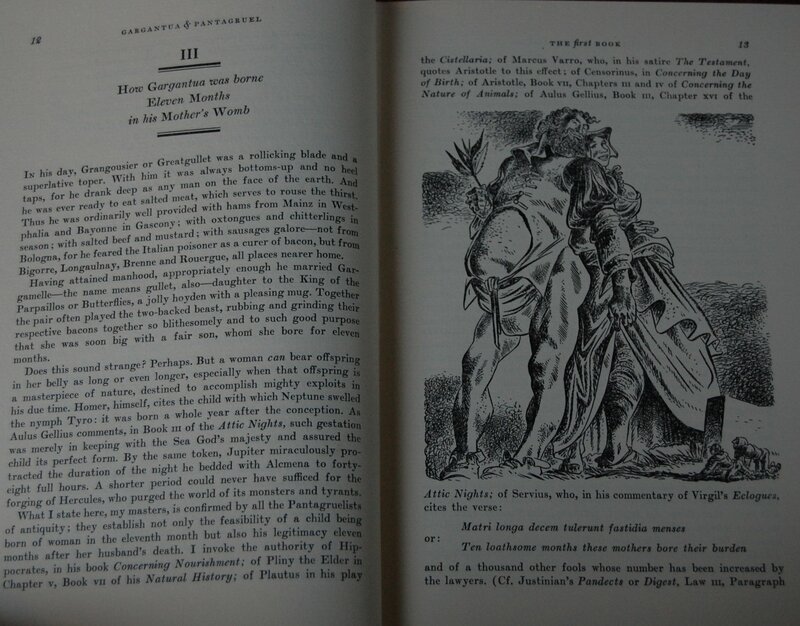 You are currently reading Heritage Press – Gargantua and Pentagruel by Francois Rabelais (1942) at The George Macy Imagery.